I have been hoping to see one of these very elusive animals now for many years, but never seem to be in the correct place at the right time, in fact I am sure I have missed glimpses of them and been very close at times, but to this day they have been hiding from me. Since the replanting of many forest of our native trees the chances to see this wonderful animal are much better, and since the 80’s it has been made illegal to kill a Pine Marten. The Pine Marten is a very shy animal and you are only likely to see them at dusk or during the night when they prefer to hunt, they like to hunt small mammals and birds but have a very sweet tooth for jam and also peanut butter, so armed with a jar of Jam peanuts and some bread I ventured off to the Western Isles to stay in a Loch side cottage for one week. 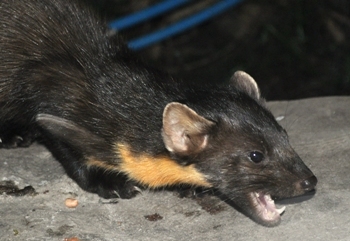 So What do Pine Martens Eat? Once I arrived at the cottage I looked around the area for any signs that a Pine Marten has been in the area, I did see some droppings that could be from a Pine marten so was this to be a lucky trip for me? About tea time I set upon the task to make some Jam sandwiches, not for me although I was hungry at this point after a long drive but especially made for my little friends hiding from me. I laid these little treats along a wide window ledge giving me a good view from my comfy throne within the cottage. Time was passing by and after a very long drive on this day I decided to give up and head for bed around 11.30pm, during a restless night as I usually have trying to sleep in an unknown house on the first night, I decided to go downstairs and have a drink of water, on passing the window to my surprise all the jam sandwiches and the peanuts I left out where all gone? Did I miss my chance or do we have another type of critter with a taste for the sweet stuff, maybe it was rats or even a fox? I headed back to bed hoping for another try the next night. On the second night I was full of hope having seen the previous nights treats vanish from my window ledge, so we a lot more hope I done my usual task of making supper for the Pine marten, again the jam sandwiches where laid in the same position as the last night with a few peanuts, after many hours of watching a film and glancing over my shoulder the time once again took its toll on my eyes and I started to fall asleep, maybe this lovely fresh Highland air is making me sleepy and the fact I have been touring the Isle of Skye all day made me tired, I once again gave up and headed towards the bedroom, maybe its just not to be a lucky week like I usually experience. On the third night I decided to use just a little bit of a different approach, I do know Pine martens have a very good sense of smell and maybe a cottage somewhere up the hill was feeding these little monsters well and they where not venturing further down the hill towards the loch. I decided to place some jam and bread on the perimeter fence of the property and place the rest on the usual window ledge adopted for my Pine Marten feast. Later in the night when I was watching a film on my laptop with a slightly twisted neck looking towards the window, I turned away for a few moments to take a drink when I heard a type of low growl I have never heard before “what’s that noise” I said to my wife who by this time for wondering if I ever wanted to look at her again, as I said this I turned towards the window and seen a Pine Marten my heart jumped a few beats and could not believe after years of looking I could actually see one with my own eyes, in fact there was not one Pine Marten but 2 fighting for the honour to sit upon the ledge with the feast, this is what the strange noise was 2 Pine Martens fighting over this enticing layout of treats laid before them. At first I could not talk for the excitement, then after what felt like 20 minutes I remembered the camera, being a DSLR camera I of course had to battle with the construction of fitting the lens which of course was a bit difficult with shaking hands. Eventually I was in position and wondered why after all the preparation had I forgotten this vital piece of equipment, what if this was to be my only chance and I missed getting a photograph to treasure this fine moment, but I did not have to worry because of the presence of the other Pine Marten my little friend was to stay on the window ledge and munch his way through my little treats I had made especially for him, he did not seemed bothered at all that I was inches away from him through a thin piece of glass, it seemed more concerned that he had the Jam sandwiches all to himself, I am calling it a him because I could not tell the difference between the two sexes, after about 10 minutes all the action had ended and I went to bed comfortable and with a smile that lit up my face. After this third night encounter I was visited every night, by what I thought could be different Pine Martens as on 2 occasions I thought that one had a slightly darker coat and much larger than the other visitors on the following nights, they ate my usual treats and my wife decided she wanted to leave an Egg out as well, I got the feeling the Egg seemed like a very prized treat as this was always generally taken first on the next visits. For me the rest of the week was a great success and the Pine Marten even visited us during daylight not long before dusk, I even seen one cross the road in front of my car during a drive out, was it the case of the tale you can wait for a bus for hours then 3 turn up at the same time, it seemed my luck had changed or was I just in the right place at the right time, I will never know but that week will stay with me for the rest of my life even if I do see many more Pine Martens, This week away in the Highlands turned out to be a bit special due to the fact that I also seen many more wildlife creatures I had longed to see in the wild, during the week we seen Golden Eagle, White tailed Eagle, Otters, Seals, and Minky Whales as well as many other small birds including the Cuckoo. A very memorable week and I will be back to the area real soon.